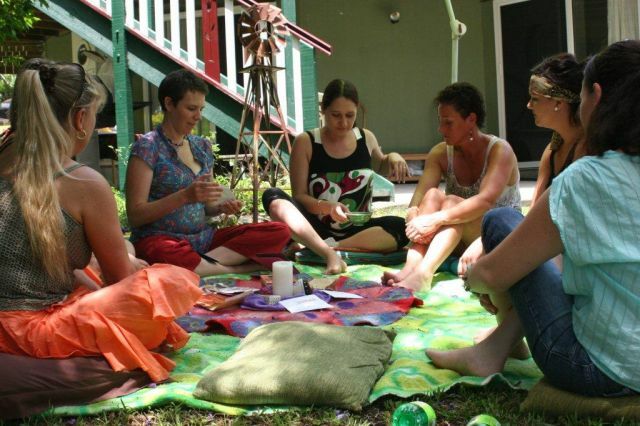 At the end of last year I helped Sarah celebrate the coming of her second baby, both in my role as a Celebrant, and as a felting teacher – together we organised a Mama Blessing felting party. We began with the ceremony, an intimate circle of friends sitting in the shade, celebrating Sarah as the Mama of Honour. We journeyed through a visualisation into a sharing and the expressing of our deepest wishes for Sarah, and the blessings she has shared as a friend over the years she has known each of the guests. It was very moving, very beautiful. After the ceremony we helped to decorate the felt that I had made for Sarah as a wall hanging to decorate the space she intended to birth in at home. 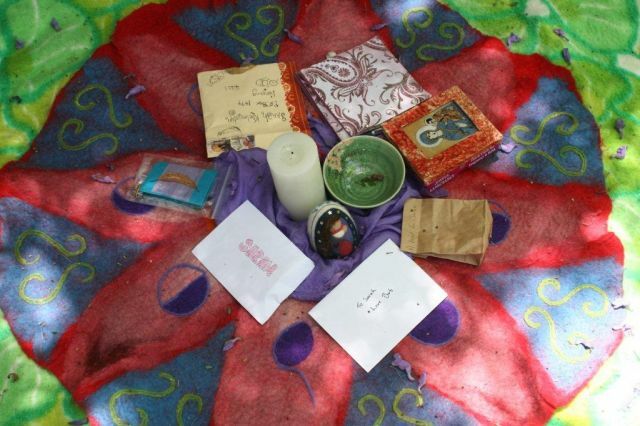 Each one of her friends and family used the felting needles to add designs such as flowers, hearts and little pictures symbolic of their relationship to Sarah. These designs decorated the outer border of her wall hanging. I couldn’t help myself … and at the end of the blessingway I was still adding things, touching up designs, making sure they were felted in well enough to last many years. 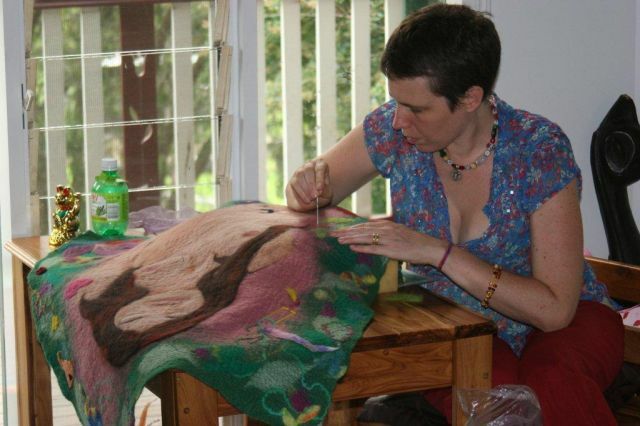 If you are interested in organising a felting party for your special function, please visit Lavendilly Fibre Arts or contact me here at this blog. 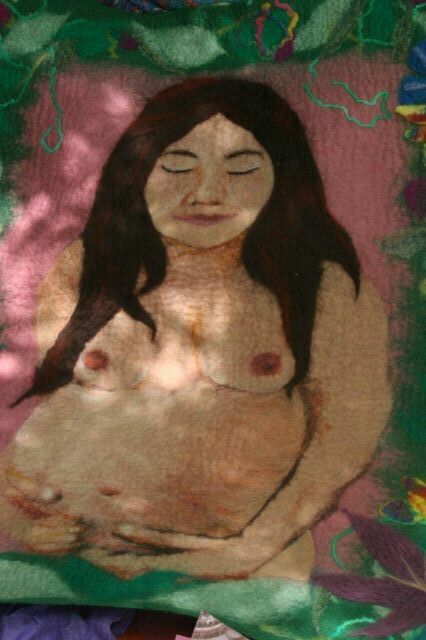 This is also an example of the portrait felting workshop I am hosting in March! Sarah’s second baby was born at home – surrounded by beautiful images of love and birth – welcome little Saffron! Sarah’s blessingway was a very special day. 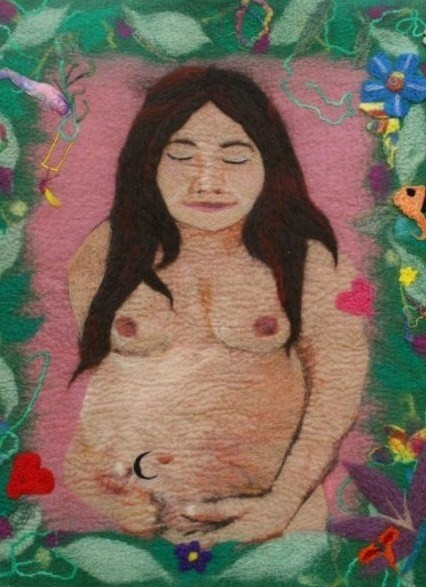 I loved the piece of felt that you made – it really was the image of Sarah!